I’m back with another cast iron skillet recipe. It really is one of my favorite ways to cook. 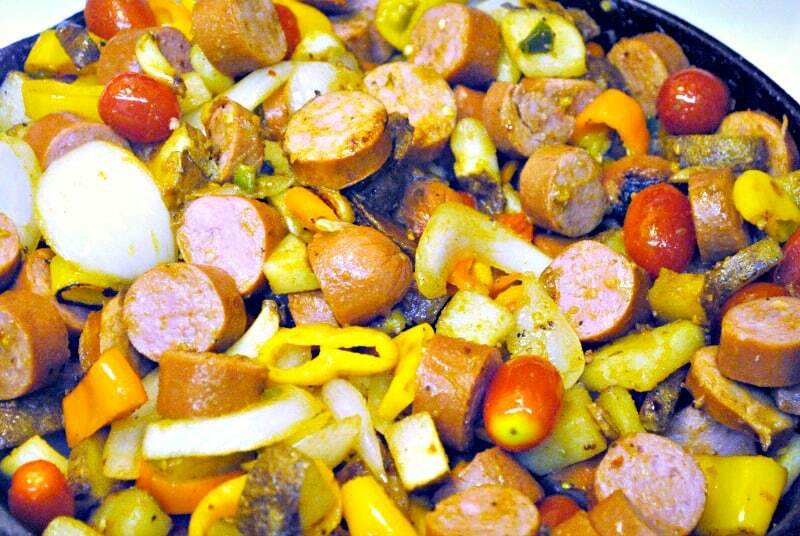 Another favorite of mine is meals that are good for breakfast or dinner, like this Sausage Potato Hash recipe. If you make it for dinner and have any leftovers, you can have the leftovers for breakfast the next morning. Two-for-one meals are awesome, too. 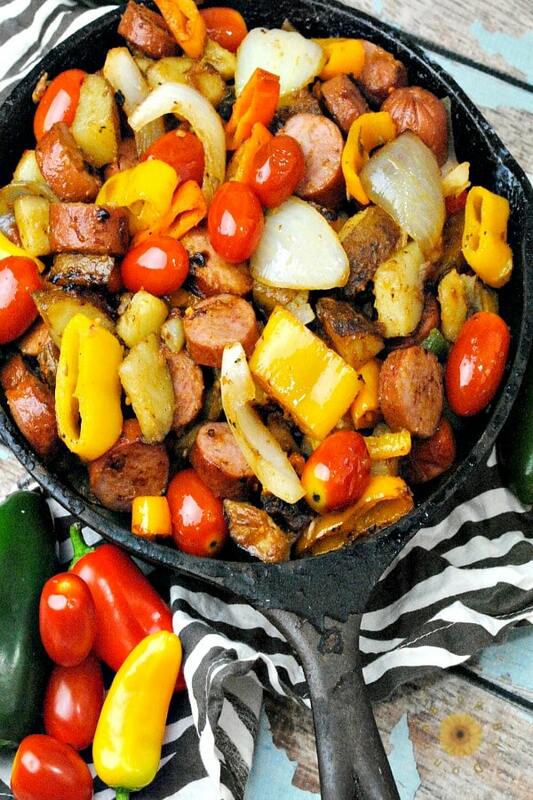 As a busy mom, I love one skillet meals. They make my life easier with less mess. Another reason to love cast iron skillets . Are you looking for cheap recipes that will help save your family money? This Sausage Potato Hash is it. 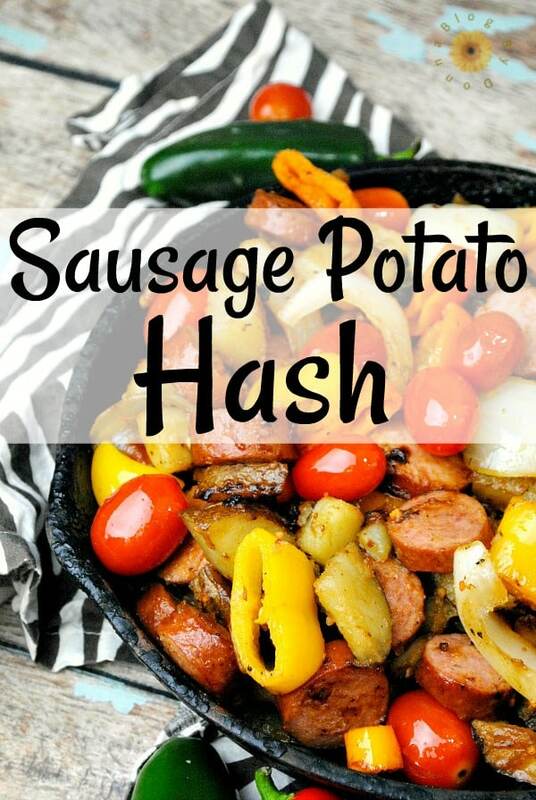 Sausage isn’t terribly expensive, and you don’t need to add a whole lot of sausage to this hash if you don’t want. So, even though I used two packages of sausage, you could use just one package of sausage. 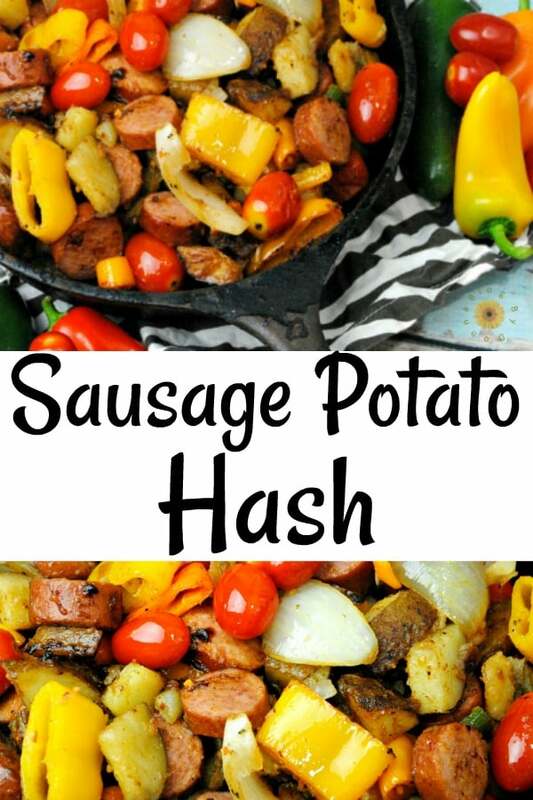 You could even split one package into two different recipes if you just wanted a little bit of sausage in your hash. In a large cast iron skillet add 2 tbsp. of olive oil and turn heat to high. Wash and dice your potatoes. 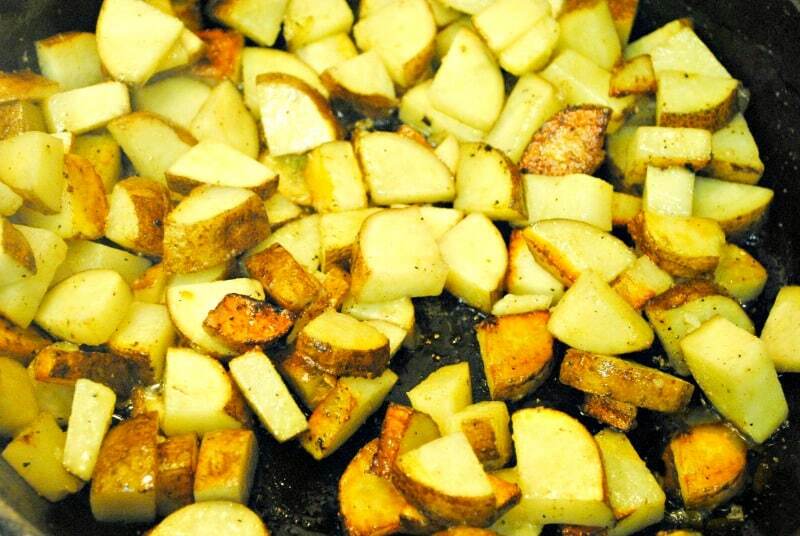 Add your potatoes to your cast iron skillet. Cook on high turning your potatoes every few minutes. While your potatoes are cooking chop the onions, peppers, and jalapenos. Make sure to remove all seeds from your jalapeños and bell peppers. 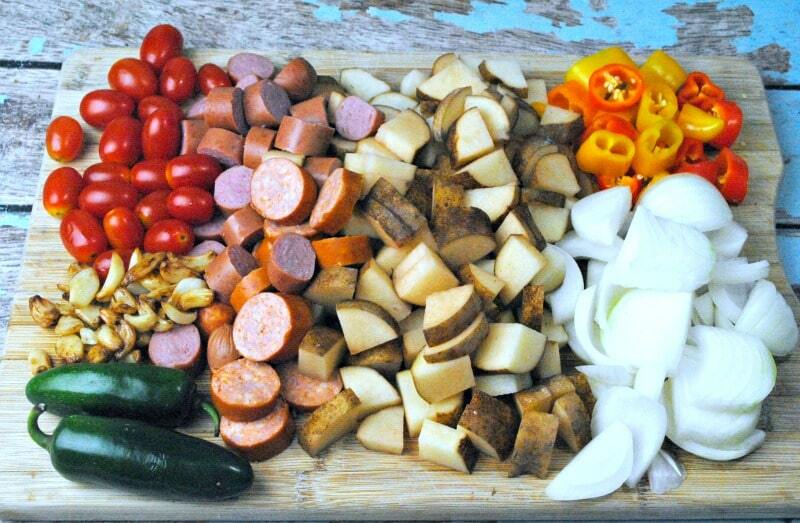 Add the vegetables to your potatoes and cook on medium for 8-10 minutes longer. Now add the caramelized garlic and toss and continue to cook for 2-3 minutes. Finally, add the sausage and tomatoes and cook for 8 minutes longer, stirring often. 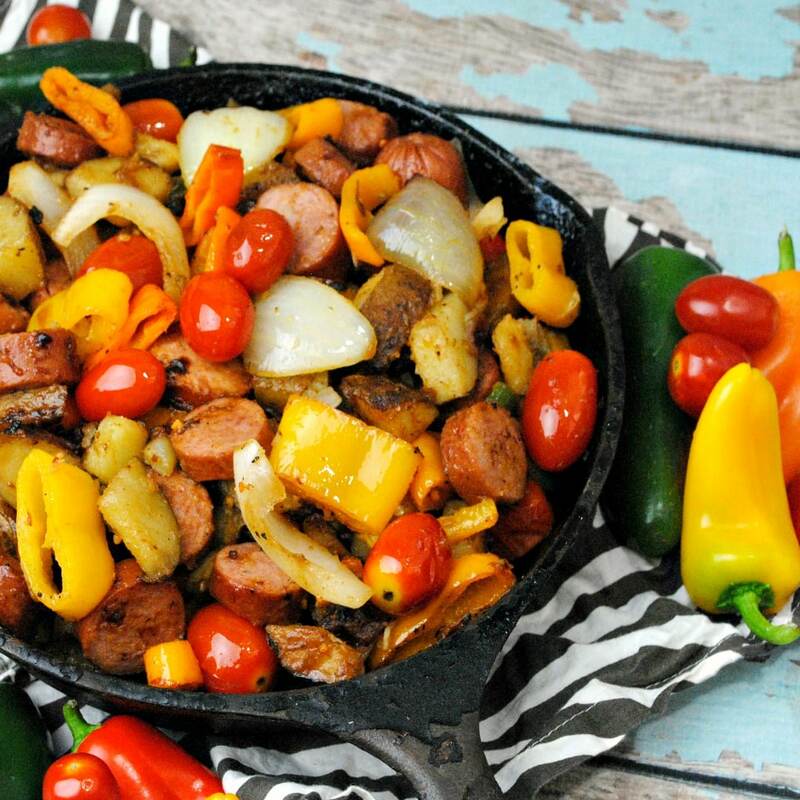 This sausage potato hash recipe is perfect for breakfast, brunch, or dinner. Another breakfast dish I love that’s good for dinner, too, is frittatas. Another way I like to eat this sausage potato hash is in tortilla wraps. We just fill a wrap and fold it up like a burrito… it is so good. Oh, if you have a cast iron skillet this is my favorite chainmail scrubber for cast iron skillets and I like this silicon handle for Lodge cast iron skillets . It really helps in keeping you from burning your hands.